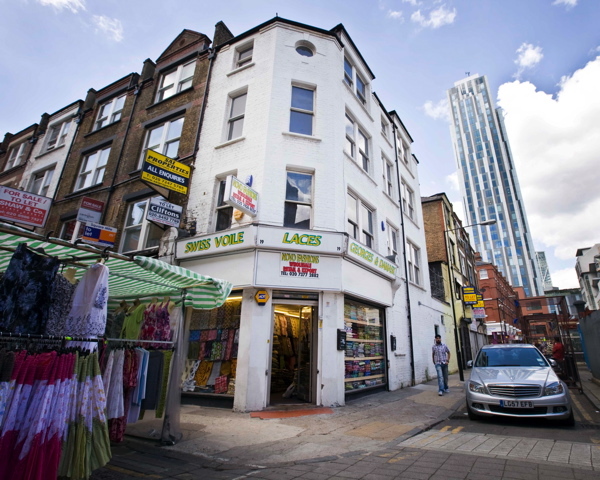 Since 1608, this neighbourhood has been known as “Petticoat Lane” on account of the textile and clothing markets here and, even though the name was changed in 1830, this is still how it is referred to. Where once Huguenot weavers wove cloth in the seventeenth and eighteenth centuries, in a location that was heart of the Jewish clothing industry in the nineteenth and twentieth centuries, today it is Nigerian and Ghanaian women that uphold the traditional identity of these streets as a centre for textiles. 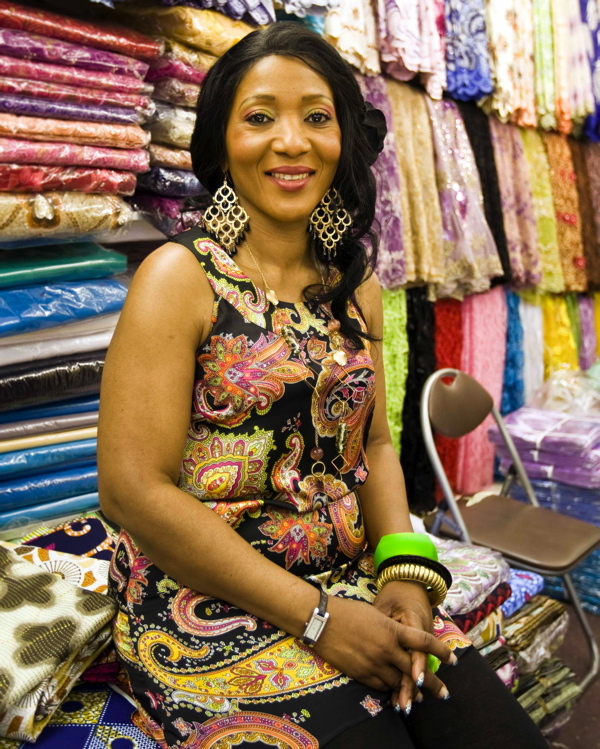 They have made it the pre-eminent destination in London for the variety and quality of African fabric on sale here. So it was a rare pleasure for me when Trevor of Liverpool St Chicken (that I wrote about in February) introduced me to Jo & Sheba Eferoghene, two vivacious sisters who run Novo Fashions at the corner of Wentworth and Leyden St, a tiny treasure trove of a narrow shop stacked to the roof with every kind of colourful attractive fabric in pattern and lace. “My mother was a dealer in Nigeria, so we learnt it from her and it is something we both love to do,” confessed Sheba, her bright eyes – enhanced by eyeshadow in peacock shades – glittering in delight. She welcomed me graciously, gesturing freely to the dazzling kaleidoscopic displays lining every wall. “The African fabric, this is what we wear – and the demand is so great that there never can be too much!”, she declared in dignified celebration. Next, Jo, the other half of this impressive duo, came to greet me from the rear of the shop – alive with charm, and emerging suddenly from the melee of vivid competing patterns resplendent in a poker dot dress. 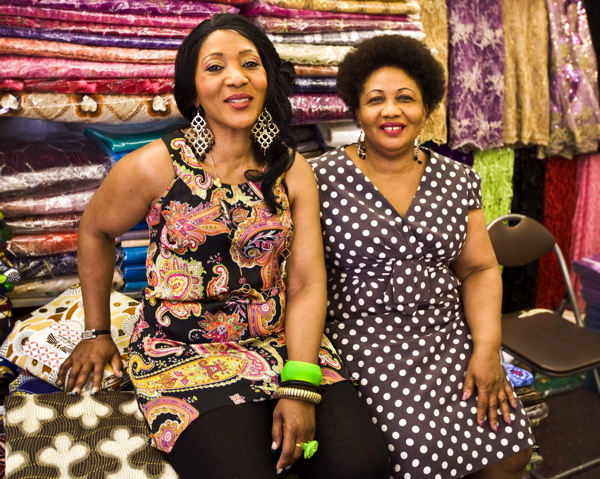 She explained that although as sisters they work together, Sheba takes more responsibility for the shop, while she, the senior, travels around the globe to buy the fabric. With the keen sensibility and shrewd authority of a born businesswoman, Jo sets out three times a year to visit the distant warehouses of the cloth salesmen who turn up in Wentworth St leaving their cards, because she wants to be certain of the quality of the fabric she is buying for her customers. The biggest selling textile in Wentworth St is “wax” – meaning batik fabric, created using the technique whereby patterns are printed onto cloth in wax which resists dye. Elaborate designs are built up through successive layers of dying, forming bold geometric patterns in strong colours. It is indicative of our modern world that very little of this “African” fabric is from Africa, in fact the best “wax” originates from Holland. Sheba apprised me of this with professional expertise, laying out a length of lustrous mustard coloured cloth as an example of “Holland wax” manufactured by Vlisco in Helmond for the African market. China and Thailand also produce wax, and Sheba hauled specimens from the shelves creating an extravagant collage of coloured cloth for me to appreciate, before she revealed there is also an “English Wax,” though ironically this recently moved manufacture from Manchester to Ghana. Cloth is sold in pre-cut lengths of six yards, sufficient to make an outfit. For a woman, six yards gives you two sarongs, a top and a scarf, or a boubou (long kaftan) plus a headscarf – whereas for a man, six yards is enough to make a buba (short kaftan) plus sokoto (trousers). Although the wax fabric is for everyday wear, Jo & Sheba also sell elaborate “lace” manufactured in Switzerland and Austria, expensive perforated cloth, sometimes richly embroidered and sequined, that is reserved for special occasions, weddings, birthdays and other celebrations. 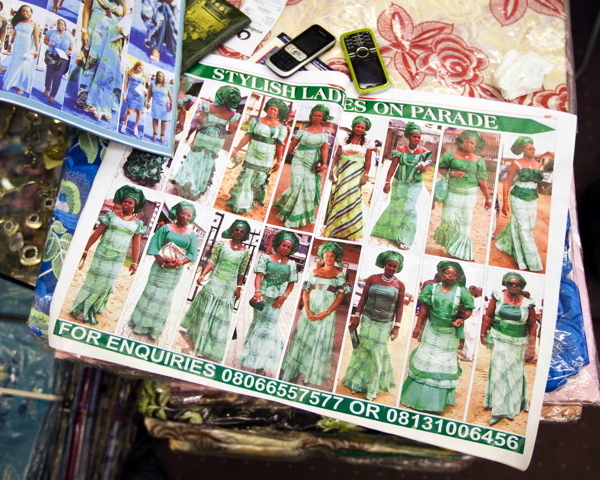 Once you bear in mind that lace can be combined with wax in a single outfit, topped off with a contrasting cloth (a gele) tied around the head and also accessorized with costume jewellery, then you begin to realise the dizzying number of permutations that are presented by the fabrics in this tiny shop. This is where Jo & Sheba offer professional advice as stylists, because commonly people come to get fabric for an entire wedding party to dress everyone in toning outfits, yet with the most expensive cloth for the bride and groom. With so many different outfits for a single event, I can see that it takes a miracle of diplomacy to steer people away from potentially disastrous colour combinations towards a sympathetic scheme. Yet equally, the creative possibilities for mixing these patterns and vibrant tones are limitless. Jo & Sheba Eferoghene have been trading in Wentworth St for eight years – dealing to neighbours and friends from their home before that – and through working together and demonstrating strength of character they have won loyal customers and built a reputation for discernment, crucial when the entire street is full of shops in direct competition. In the serious business of wax and lace, these two proud sisters know what they are talking about, and the photographs below of them modelling their own glorious fabric are absolute confirmation that they really know how to wear it too. Novo Fashions at the corner of Wentworth St and Leyden St. 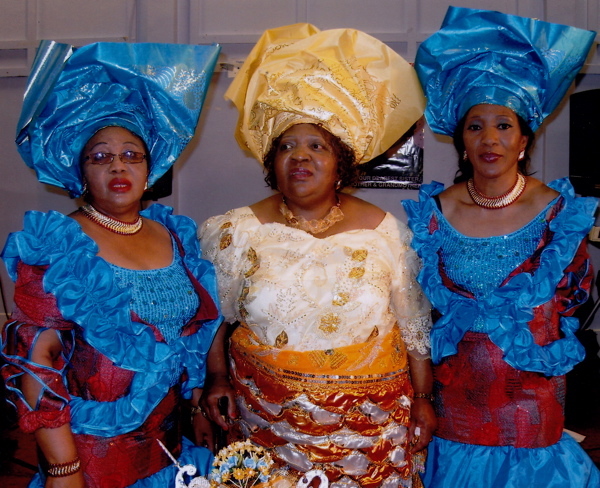 The Eferoghene sisters, Jo, Helen & Sheba, celebrating Helen’s sixtieth birthday in their own fabrics. 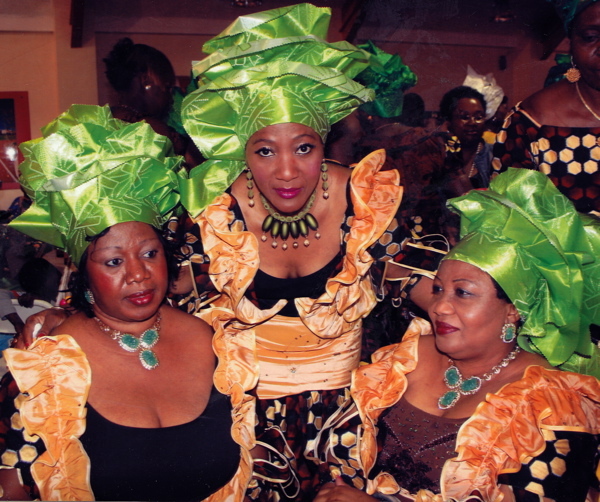 Rose, Sheba & Jo at a wedding celebration for which Novo Fashions supplied the fabric. Jo, Morayo, Rose & Sheba at a child’s tenth birthday party dressed in Novo Fashions’ fabrics. This is beautiful. The photos remind me of a book I have in a box somewhere – Homer Sykes’ portraits of the congregations at black churches in Britain ‘The Storm Is Passing Over’. 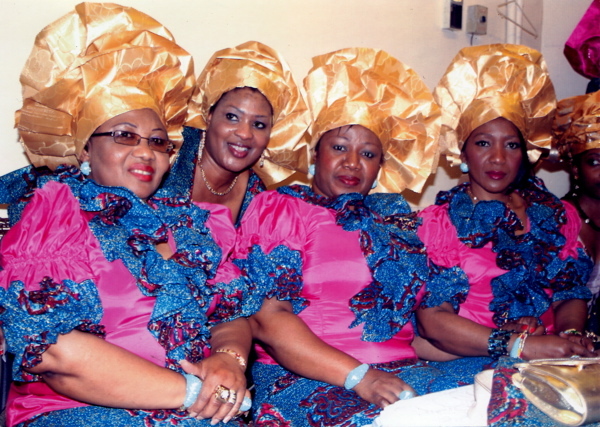 I would love to see these ladies photographed in front of Yinka Shonibare’s ship in a bottle in Trafalgar Square. And I love the technical descriptions of the fabrics. I was surprised, during a year long stay in Australia, to find that over there household linens departments in shops are called Manchester departments. Best wishes Homer, and thanks for buying our book. Do you sell aso oke?